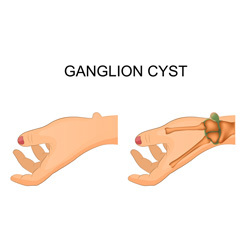 Ganglion cysts are the most common mass or lump in the hand. They are not cancerous and usually harmless. They occur in various locations, but most frequently develop on the back of the wrist. These fluid-filled cysts can appear, disappear and change size. If the cyst is painful, interferes with function, or has an unacceptable appearance, there are several treatment options. A ganglion balloons out of the tissues surrounding a joint in the hand, wrist or fingers and usually forms a visible lump. A thick, slippery fluid is inside the cyst. They vary in size and may grow larger with increased wrist activity and deflate with rest. If a cyst puts pressure on the nerves that pass through the joint, it can cause pain, tingling and muscle weakness. What triggers the formation of a ganglion is a mystery. They are more common in younger women, 15 to 40 years. Ganglion or mucous cysts that develop at the end joint of a finger are typically associated with arthritis and common in women, 40 to 70 years. A DOC orthopedic specialist will discuss medical history and symptoms such as the cyst’s longevity, whether it changes in size, and if it is painful. X-rays create clear pictures of dense structures like bone, but will not show a Ganglion cyst. X-rays help to rule out other conditions such as arthritis or a bone tumor. Magnetic resonance imaging (MRI) scans or ultrasounds show soft tissues like a ganglion and distinguish the cyst from other tumors. Initial treatment of a ganglion cyst is not surgical since it is not cancerous and may disappear in time. So the DOC PA or surgeon may recommend observation only or a wrist brace or splint to relieve symptoms and shrink the cyst. If the ganglion causes pain or severely limits activities, the fluid may be drained from it, aspiration. Sometimes the ganglion cyst returns after an aspiration procedure. If symptoms are not relieved by nonsurgical methods or if the ganglion returns after aspiration, surgical removal, excision, may be necessary. Surgery involves removing the cyst as well as part of the involved joint capsule or tendon sheath, which is considered the root of the ganglion. Excision is typically an outpatient procedure and patients are able to go home after a period of observation in recovery. Normal activities usually may be resumed two to six weeks after surgery.